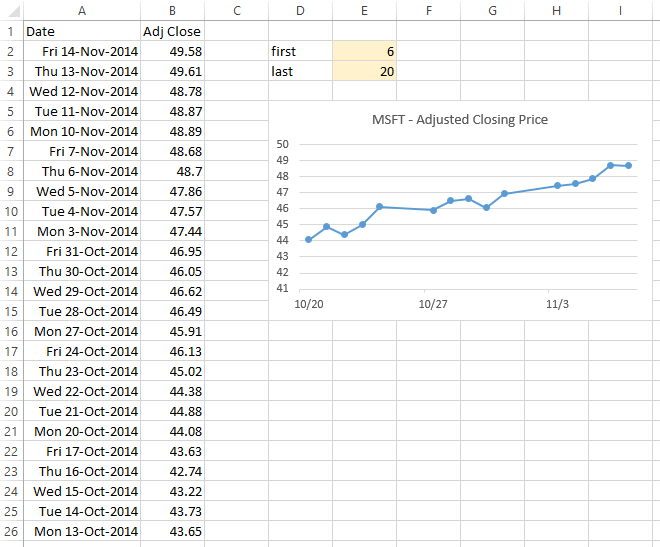 Excel is pretty handy for collecting, analyzing, and charting lots of data. 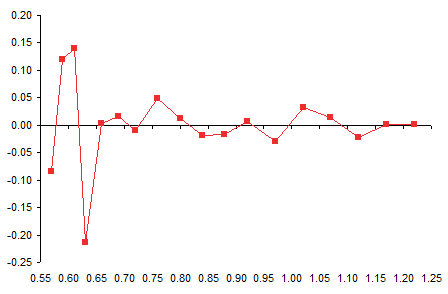 If you want to plot a subset of your data, you can manually adjust the data range used by the chart. But there are easier ways to select partial data ranges, and to make this selection less tedious than manually adjusting the chart’s data. 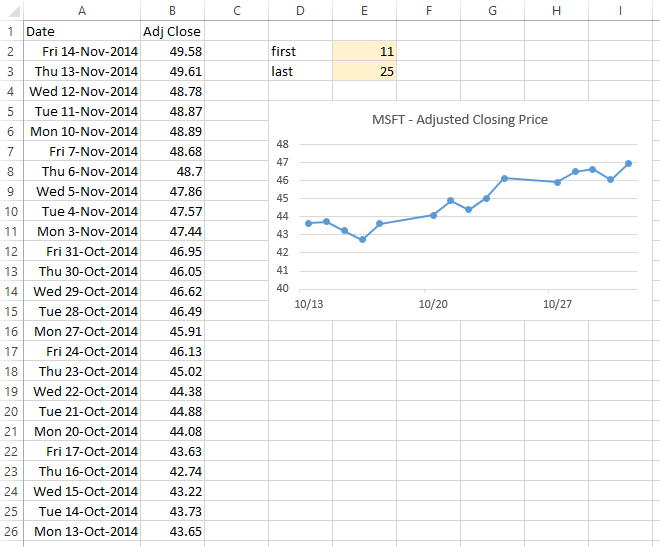 In the workbook named “MSFT Price.xlsx” (click to download) and its worksheet named “MSFT 5-week” I have a range and chart showing five weeks of Microsoft adjusted closing price data. and that the series can be edited right in the Formula Bar, just like any other Excel formula. 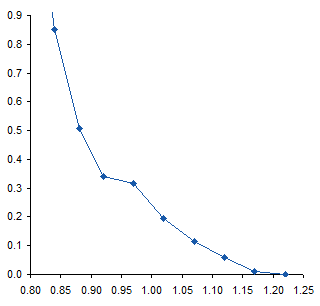 A commonly asked question is, How can we plot part of this data, based on some kind of lookup? We’ll use a technique known variously as “Names” (the official moniker), “Defined Names”, “Defined Ranges”, and “Named Ranges”. I’ll show three approaches, which increase in complexity but also in ease of use. 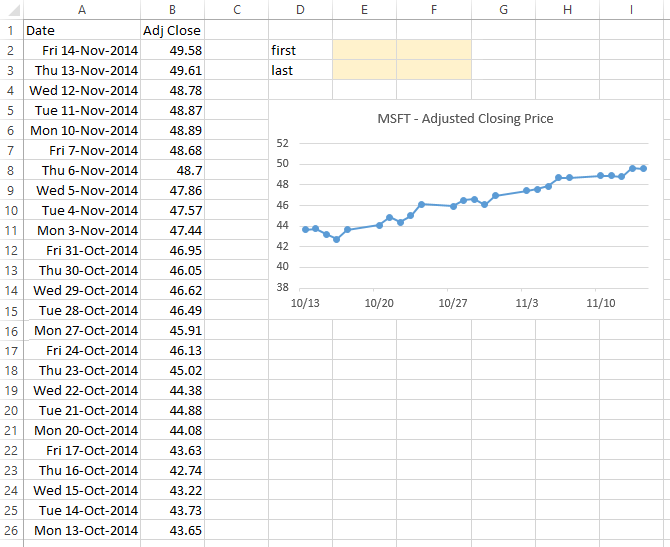 This exercise is in a worksheet named “MSFT By Index”. The data is the same and the chart is nominally the same as above. 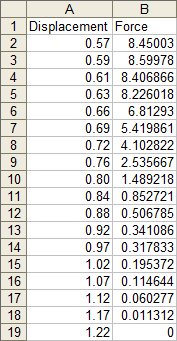 We’ll use cells E2:E3 to contain the index of the first and last rows of the data range we want to plot. 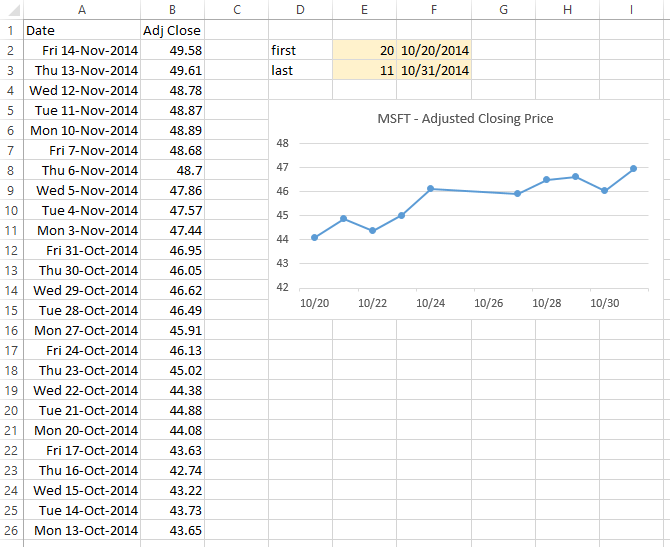 We will count rows in the data range and enter values into these cells. To define names, go to the Formulas tab of the ribbon, click on the Define Name button, and select Define Name… from the dropdown menu. The New Name dialog appears. You can name the name, define its scope to the entire workbook or to one of its worksheets, add a comment, and write a formula which the name refers to. OFFSET takes three arguments: a reference range, the number of rows down from this reference (up for a negative number of rows), and the number of columns to the right of the reference (to the left for a negative number of columns). OFFSET may take two more arguments: the number of rows high and the number of columns wide the resulting range is; if height and width are not entered, the resulting range is the same size as the reference range. 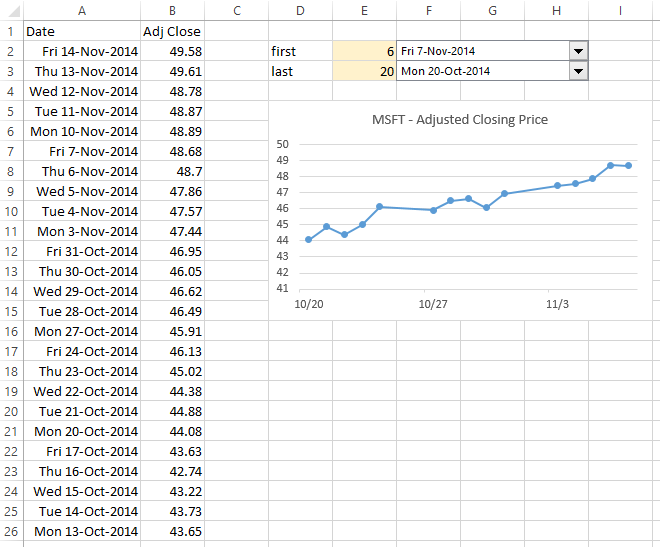 indicates the cell $E$2 rows down and zero columns right from $A$1. Combining the two OFFSETs, separated by a colon, indicates the range bracketed by the two cells. Adjust the first and last indices in E2:E3, and the chart updates to reflect the new range. 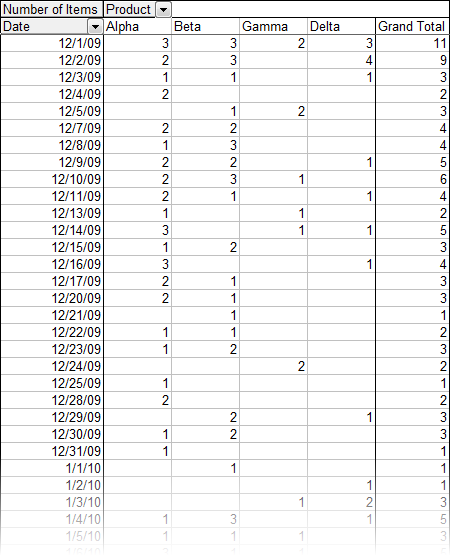 This is a bit tedious in practice, since you need to count rows and enter your findings in the index cells. It is not hard to make the process easier. This exercise is in a worksheet named “MSFT By Match”. The data and the chart are the same as above. We’ll use cells F2:F3 to contain the first and last dates of the data range we want to plot. Formulas in E2:E3 will determine the index of these dates within the date range, so we can use the same formulas as above for our names. We will enter dates into cells F2:F3 and let Excel calculate the index values in E2:E3, which is a little nicer than counting rows and typing a number. The last argument (-1) in the functions is needed because the dates in column A are listed in descending order. Omit this argument, or use +1, for data sorted in ascending order. Use zero if the data are unsorted labels. 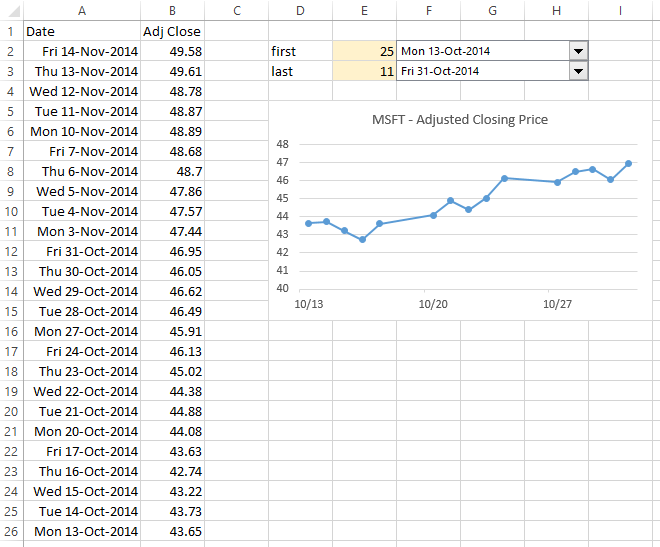 Adjust the first and last dates in F2:F3, and the chart updates to reflect the new range. It’s much easier to enter dates than to count rows, especially if the overall data range extended beyond the number of rows visible in one screen. This exercise is in a worksheet named “MSFT By Combo”. The data and the chart are the same as above. We’ll use combo box controls that let us select the first and last dates of the data range we want to plot. The combo boxes link to cells E2:E3, so we can again use the same formulas as above for our names. Now we’ll use the best method in this article: we’ll select the dates we want using the combo boxes. 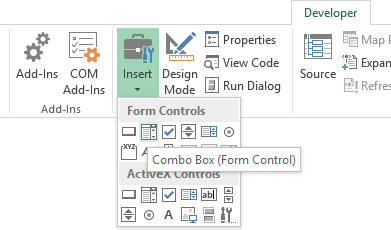 To add a combo box control, go to the Developer tab, click Insert, then click the Combo Box from the set of Forms Controls. The cursor turns into a shape crosshair; use this to draw the combo box. If the Developer tab is not visible, you have to change your settings. 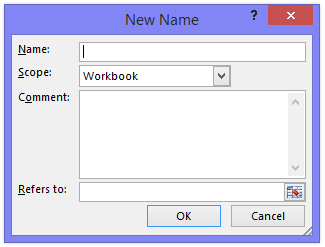 In Excel 2010 and 2013, click the green File tab, select Options, select Customize Ribbon, and in the long list of tabs on the right, check the box in front of Developer. 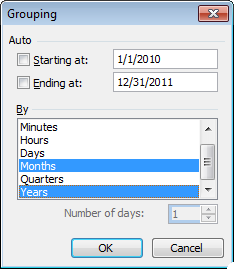 In Excel 2007, click the big round Office button in the top left of the Excel window, click Excel Options at the bottom of the dialog, then check Show Developer Tab in the Ribbon. Right click on the combo box, and choose Format Control from the pop-up. Select the input range (the range of dates that you want to appear in the dropdown) and the cell link (where the index of the selected date will appear). 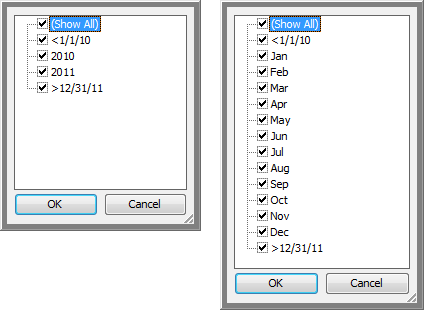 Adjust the first and last dates selected in the combo boxes, and the chart updates to reflect the new range. Posted: Thursday, November 20th, 2014 under Data Techniques. Last week in Series Lines: Useful or Chart Junk?, I wrote about Excel’s “Series Lines” feature, and how it seems like a good way to clarify the data in a stacked column chart, until you implement it and realize it just adds chart junk to your chart. I proposed a panel chart to show the stacked chart data more clearly. Joe Mako commented that the line chart I showed prior to building a panel chart could be cleaned up by taking the rolling percentages of the cumulative total of the original data. I agreed that it makes the chart look cleaner, but I think it forces us to sacrifice too much detail in the data. I’ll illustrate my reasoning in this post. These are the original values I used in my previous post. Here are the stacked column chart and line chart of this data. They are rather cluttered, and not easy to interpret. Here is the panel chart. 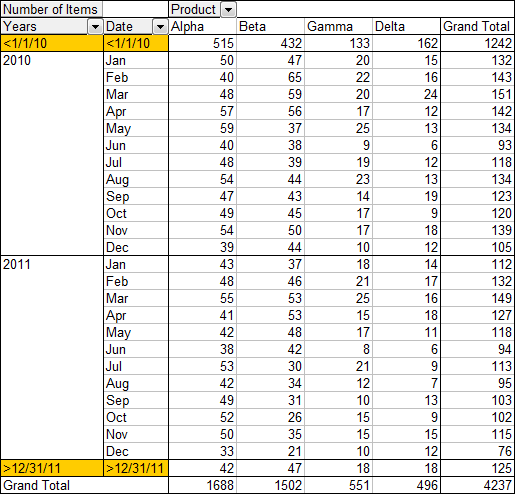 Splitting the data into separate panels according to category makes it much easier to see trends within an individual category and to compare values across categories. This table shows the data as a percentage of the annual total. 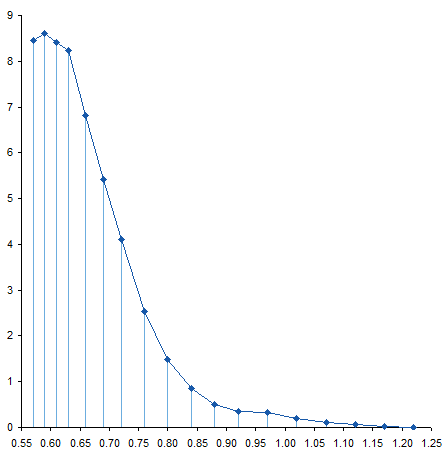 For example, the “alpha” value for 2005 is the alpha value divided by all values, or 16/(16+14+13+10+8), or 26.2%. The stacked chart is now flat across the top, because the total in each year is 100%. 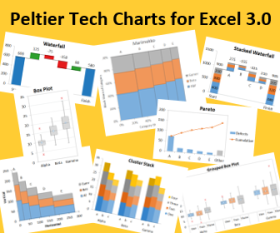 The details within the stacked column chart and the line chart are no easier to see than the charts showing the individual values. In fact, it’s hard to see the differences between these and the earlier charts. The panel chart of the percentage data isn’t much different than that for the individual values, and it is much easier to read than the stacked and line charts. Here are the calculations proposed by Joe Mako. The values for the first year are the same. The values for the each subsequent year are the values for a given category for all years so far divided by the values for all categories for all years so far. So alpha for 2006 would be (16+18)/((16+14+13+10+8)+(18+17+12+9+8)), or 27.2%. Essentially each year’s rolling value is a weighted average of the current value with the previous years’ values, which results in a smoothing of the data. The data is smoothed so much that it’s not easy to see much difference at all within any particular category in the stacked chart below. In the line chart, we can make out trends, but they are not nearly as pronounced as in the original data or in the annual percentages. The panel chart also shows this smoothed data. So why don’t I like this smoothing of the data? Smoothing can be helpful when you’re trying to find patterns in noisy data. In fact, I’ve written about LOESS smoothing in Excel, and I’ve released a utility to perform LOESS smoothing on worksheet data. But smoothing can also obliterate details in data, and it can give the wrong impression of trends in the data. In the latest stacked column chart above, the variation in the data from year to year has been almost smoothed out of existence. The latest line chart contains more white space, because points have been moved away to provide this space. The line charts below compare how the unsmoothed data compares to the rolling average data. In the chart on the left, the first and last years in the analysis are connected, without showing the intervening years. The solid symbols and lines show the annual percentages, while the open symbols and dashed lines show the rolling averages. The lines start at the same points in 2005, and both sets of data move in the same direction. But for all categories, the rolling averages change much less than the annual averages. The rolling averages make it seem that alpha and beta have become close in value, while the annual averages show that they have diverged to a great degree. 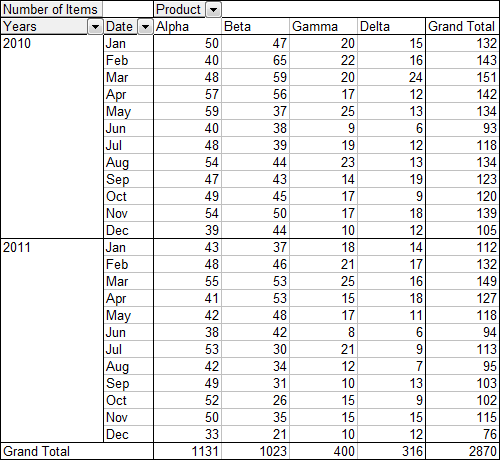 The rolling averages show that gamma, delta, and epsilon have moved very close to each other, while the annual averages have changes so much that the categories have crossed each other and reversed their order. The line chart on the right is another view of the two sets of data. As is often the case, the panel chart shows the data most clearly. The blue solid diamond markers show the annual percentages, with their considerable variability, while the red open squares show very gradual changes. The smoothed data in this case tends toward the overall time average of the data. Data soothing can be a useful tool for teasing patterns out of noisy data. It’s important that the consumer of the data understands the unsmoothed and smoothed data, and how the smoothed data may have been distorted by the smoothing technique used. Posted: Monday, January 9th, 2012 under Data Techniques. In Getting value on Y axis by putting X axis value on the Mr Excel forum, someone wanted to know how to find in-between values of a function, given some known data points. 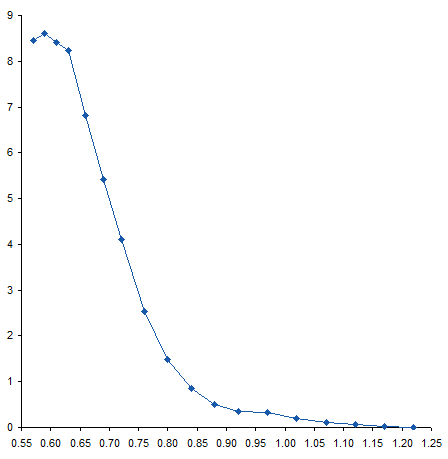 The approach, of course, is to interpolate values given the known points on either side of the value you need. Interpolation requires some simple algebra. The diagram below shows two points (blue diamonds connected by a blue line) with coordinates (X1, Y1) and (X2, Y2). 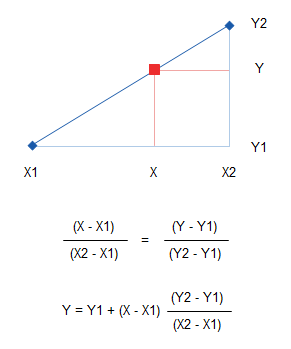 We need to find the value of Y corresponding to a given X, represented by the red square at (X, Y). The smaller triangle with hypotenuse (X1, Y1)-(X, Y) is “similar” to the larger triangle with hypotenuse (X1, Y1)-(X2, Y2), so the sides of the triangles are proportionally sized, leading to the first equation below the sketch. We rearrange this to solve for Y, in the second equation. We’ll set up our interpolation in the example below. Our data is in A5:B18, and the known values are plotted as blue diamonds connected by blue lines in the chart. The analysis has two parts: first we need to determine which pair of points to interpolate between, second we need to do the interpolation. 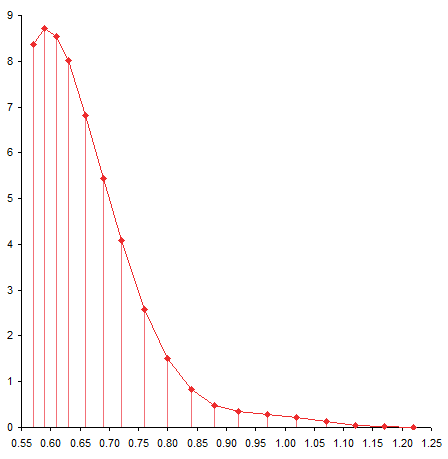 We will judge the validity of our interpolation by plotting the calculated point on the same chart. We want the Gauge value (Y) when the Flow value (X) equals 3, so this is entered into the yellow shaded cell A2. The formula in A3 tells us that our computed point is between the 7th and 8th data point, and the formula in B2 calculate Y=0.444, and the calculated point (A2, B2) is the red square that lies along the plotted data points. Looks good. Te determine the Gauge value for a Flow value of 12, we enter this into A2. 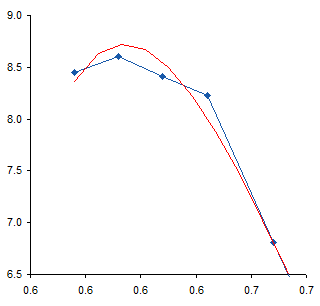 The red square moves along the blue line past the 11th point, where Gauge=0.548. 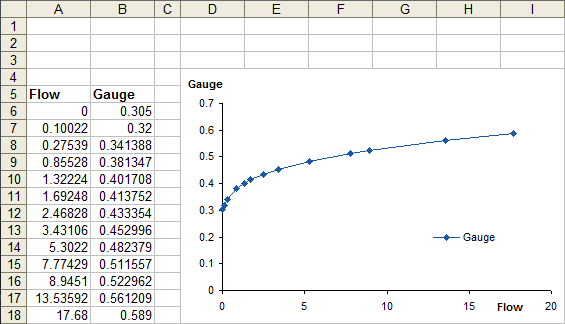 For a Gauge (Y) of 0.53, we compute a Flow (X) of 9.790. 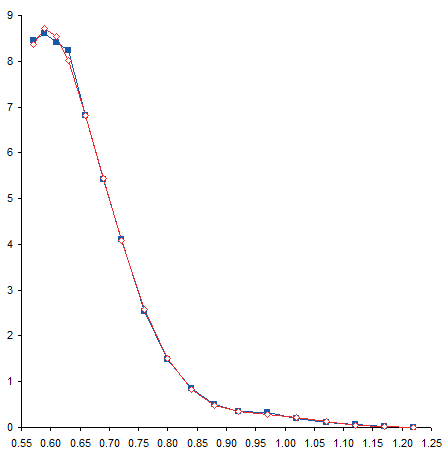 The red square shows where the calculate point lies along our plotted data. Changing the Gauge value to 0.35 moves the red square way to the left, to a Flow value of 0.400. Posted: Thursday, August 18th, 2011 under Data Techniques. A reader of my post about Trendline Fitting Errors asked how to calculate area under a fitted curve. His stated problem was that when he tried to calculate points based on the fit, it didn’t come close to matching his measured data, even though the fit had a very high R² value. I suspect this problem was due to the tricky nature of the Excel formulas needed to make the various calculations. Another problem, which is stated in the Trendline Fitting Errors post is that the reader had calculated a 6th order polynomial fit to his data. This is fine, I guess, if you only need the data for interpolation, the fit is close, and due to curvature the fit deviates from a straight line between points. 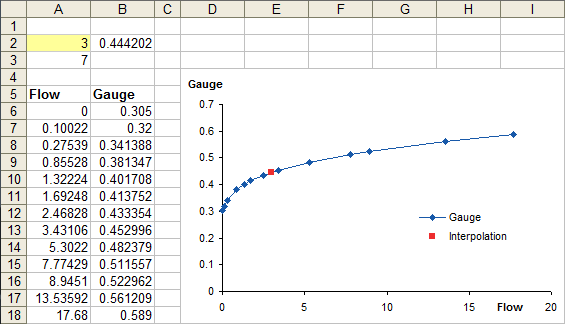 Despite the problems with using a sixth order fit, I’ve decided to work out the calculations and compute the area under the curve, both under the measured data and unser the calculated data based on the fit. The measured data is shown in the table below. This represents the force needed to move a surface closer to a particular molecule starting at a distance of 1.22 (which is asymptotically close enough to infinity that we assume a force of zero). 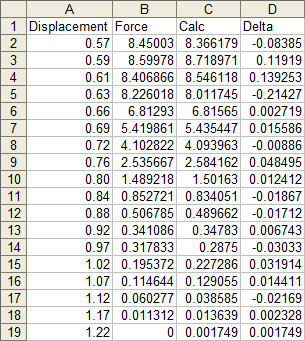 The units of force and distance are not stated, but it doesn’t matter for this exercise. As the surface approaches the molecule, the force increases, until it is close enough to start to distort the molecule, at which point the force tops out and even decreases at the closest measurement. Here’s a plot of the data. When I first saw the data, I mentioned to the reader that there appeared to be a bump in the curve near the bottom. I’ve zoomed in on this region below. The curve coming from the upper left doesn’t match up with the curve coming from the lower right, resulting in a zig-zag at about X=0.95. To me this means there may be some slippage in the mechanism that moves the surface, or some other experimental inconsistency. I would think that the actual curve would look like the dotted line below. 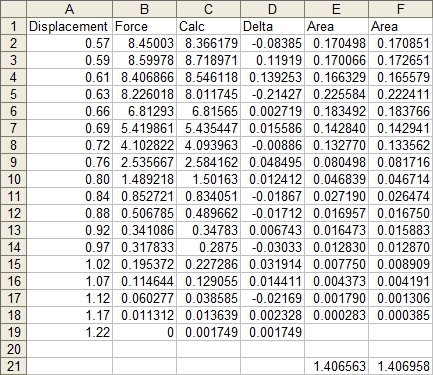 If it were my experiment I would repeat the measurements, but the exercise below was performed on the unmodified data. 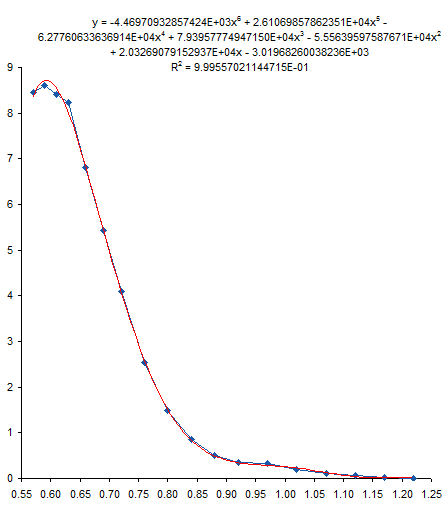 I added a 6th order polynomial trendline to the data. Then, since trendlines are bold black lines that blast your eyes and obscure the data being fitted, I formatted the fitted curve as a thin red line. 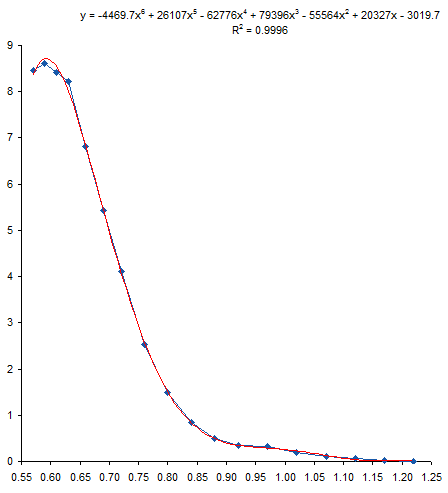 For most of the range of data the trendline fits pretty closely to the measured data, and the R² value of 0.9996 is very close to a perfect 1.0. Near the top of the data, the trendline is not very accurate, overshooting the maximum of the measured data, then overcompensating for the decline in the last point. The fit at the opposite end also isn’t very good. The red line careens back and forth like an out-of-control bobsled trying to hold a line. Note how the trendline is thrown off by the discontinuity I remarked about earlier. The trendline actually reaches a local minimum at about X=1.15, then a local maximum at about X=1.20, before continuing downward, but not quite to zero. These deviations of the trendline from the measurements, particularly the serpentine behavior at the lower end of the data, illustrates the problem with high order polynomial fits. There’s really not a physical basis for choosing such a fit; it’s simply convenient and gives a high R². Of course, a high R² is not the only reason to select a particular mathematical model, and does not by itself mean the model is a good one. You have to decide whether you think the selected model or the actual measurements know more about your data. We must take care using the trendline equation in the earlier chart. Its coefficients have only five digits, and with so many coefficients multiplied by so many powers of X, errors can accumulate. 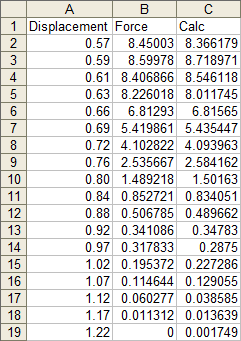 Here are the points calculated with these imprecise coefficients. Not very good agreement: the calculated points deviate somewhat more than the trendline at the top, and they go off in another direction entirely at the bottom. We can improve the precision of the coefficients by formatting the trendline formula in the chart to use scientific notation with 14 digits after the decimal point. It’s ugly, but it’s precise. Now, we could then retype all of these coefficients into worksheet cells, but that would take a long time and leave us cross-eyed. 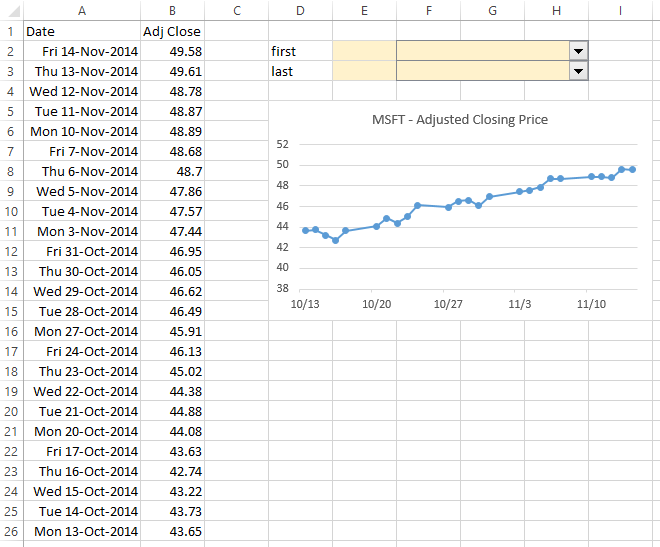 The better approach is to let Excel make the calculations using its LINEST worksheet function. You need a range with five rows and one plus the order of the poly fit columns. For a sixth order fit, we need seven columns. 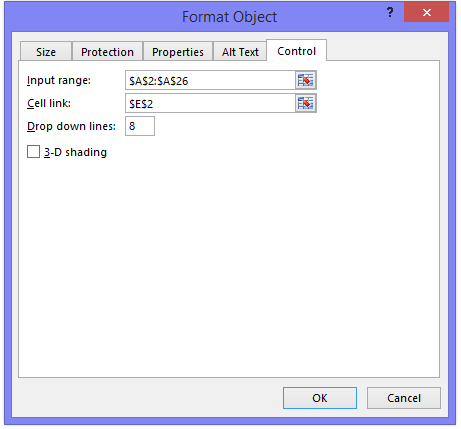 Select the range with the active cell in the top left of the range, type in the formula below, then hold down CTRL and SHIFT while pressing ENTER. CTRL+SHIFT+ENTER produces an array formula, which is a topic that could cover dozens of blog posts. After pressing CTRL+SHIFT+ENTER we get the following table. I’ve inserted headers at the top to remind me which coefficient is which. Now we can calculate values at the X values of interest. In this case, I’ve used the same X values for which we have measured data. The formula in cell C2 is shown below, and it is filled down to C19. 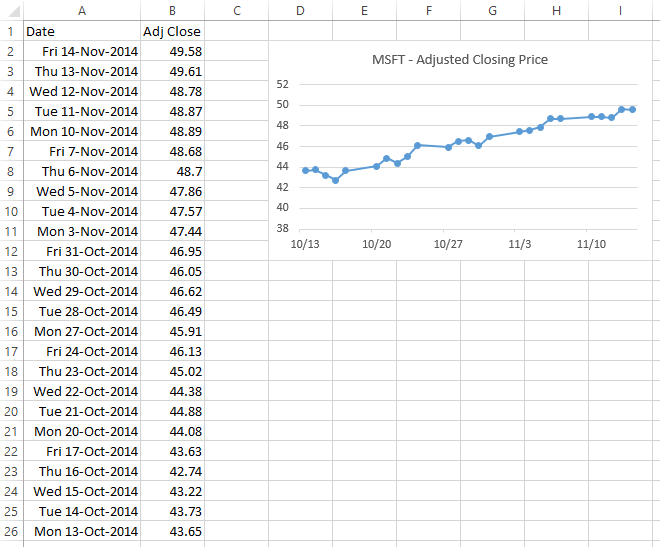 These points exactly fit the trendline, and are pretty close to the measured data. I’ve removed the curved trendline and connected the calculated points with straight lines. 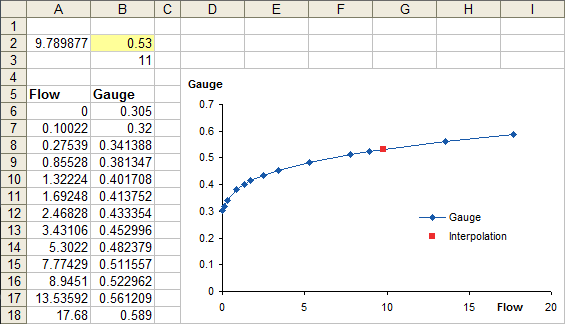 With this formatting it may be easier to see the deviation of the calculated points from the measured data. We can easily calculate the deviation between measured and calculated points. 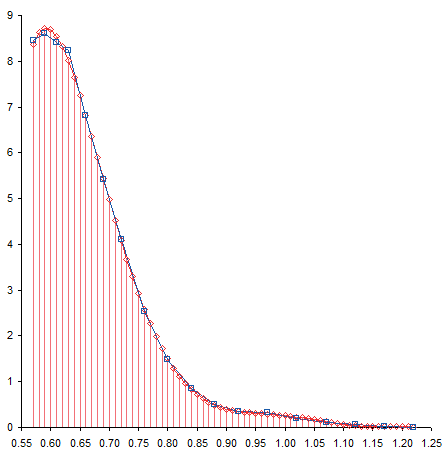 Column D simply shows the difference between columns C and B (calculated minus measured). And here is a plot of the residuals, which is the fancy word statisticians use for this deviation. It’s particularly high at the left end of the data (the top, where the trendline overshot the maximum, then overcompensated on the rebound. The original question the reader had was “What’s the area under the curve?” I think the whole polynomial overfit was really a distraction. To calculate the area under a curve, we can cut the area into slices, figure out the area of each slice, then add them up to get the total area. We already have data points at certain intervals, so let’s slice the curve at each point. Here is the sliced up area under the measured curve. Here’s the sliced up area under the calculated curve. Not too different. The total areas are summed in row 21. The two computed areas are unusually close, differing by less than 0.03%. In this case, there was no benefit to using a trendline to calculate this area. You could make the case that trapezoids don’t accurately capture the area under a curve if the data shows lots of curvature. If we had taken measurements more frequently, our points would lie under or over the straight top segments of our trapezoids. 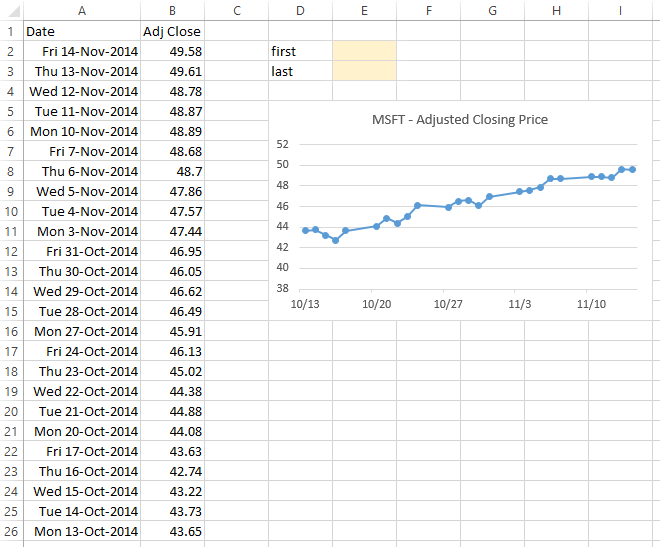 If we believe our trendline, we could calculate values at closer intervals, as shown below. We might then say that the computed area was more accurate. The area calculated for the thinner slices was 1.404070, which is about 0.2% less than the areas computed using thicker trapezoids. 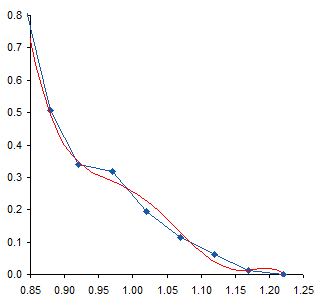 This difference is probably from the range between X=0.80 and X=0.97, where curvature in the trendline moved it below the straight line segments of the measured data. Is this a better value? It’s not substantially different from the calculation based on only the unmodified measurements, and I’m sure there are greater sources of error in the experimental setup. Posted: Monday, May 2nd, 2011 under Data Techniques. Tags: calculating area, polynomial fit, trendline.